I don't know about you, but the television at my house has been dominated by 24 hour news networks for the last month. My husband is deeply invested in the political race and financial crisis we face and he refuses to relinquish the remote in favor of...less stressful programming. Thank God for Tivo. The entire fiasco makes me want to retreat to the couch with a warm blanket and a glass of red wine. Now that we're deep into autumn here in Minnesota, it also makes me want to make pot roasts and apple crisp, and mashed potatoes and dozens of other foods guaranteed to make you lethargic and apathetic. This time of year, Caribou Coffee prevails over my dedication to Starbucks with their very yummy pumpkin pecan bread. When I was little, I hated finding nuts in cookies or salads or quick breads-anything. Now that my palate isn't so delicate, I can't get enough. I've tried several recipes, hoping for one that's close to Caribou's, and I finally figured out the secret-you've got to toast the pecans! A-HA! Beat first 11 ingredients at low speed with an electric mixer 3 minutes or until blended. Add 2/3 cup water, beating until blended. Stir in pecans. Pour batter into 2 greased and floured 9- x 5-inch loaf pans. Bake at 350° for 1 hour and 15 minutes or until a wooden pick inserted in center comes out clean. Cool in pans on a wire rack 10 minutes; remove from pans, and cool completely on wire rack. To toast the pecans in the oven: Preheat oven to 300 degrees. Spread pecans evenly on a baking sheet and bake 10 to 15 minutes, stirring often, until pecans are fragrant and lightly browned. Undercook slightly as pecans will continue to cook after they are removed from oven. Cool completely. Store in an airtight container in the freezer of refrigerator. You have to try really hard to not be happy when experiencing weather like we've had the last couple of weeks. Impossibly blue skies, temperatures in the mid to upper seventies, and sunsets every night that leave me awestruck. Even a painful dentist visit hasn't dampened my spirits. In the last week, I've discovered that lightning bugs (or fireflies) are showing up in my backyard. I don't know what happened to the lightning bug population over the years, but when I was a child the skies were filled with them at night. Unless I'm in remote rural areas, I never see them during the summer anymore. Any ideas how to develop a thriving firefly population? I would love to see their flickering all over my neighborhood each evening. So, it's the 4th of July already. I believe I promised a recipe a couple weeks ago, then never delivered. Shame on me. The garden calls, and then we had the entire downstairs interior of our house painted last week which was demanding, but produced gorgeous results. When I finish cleaning the house, I'll share some pictures. These are from a Realtor in my office, who I believe snagged a blue ribbon from the State Fair for her efforts-deservedly so. Lemon bars are such a perfect summer treat, but these have pecans, which I think make them even more exceptional. Can you omit the pecans? I suppose, but I don't know why you'd want to do such a crazy thing. These bars look like they belong on a red and white checked tablecloth, next to some homemade fried chicken and tangy potato salad. You should definitely include them for your menu tomorrow. They seem like they should require so much more effort than they actually do. Maybe after you make them, you should rub some flour into your clothes and smear a little on your cheeks to make it seem like you slaved for hours in the kitchen whipping these up. Mix together the above ingredients with a fork or pastry blender until crumbly. Press into an 8 inch square baking pan and bake for twenty minutes at 350 degrees. Crust will still look white when finished, do not brown it! Mix all the filling ingredients, except pecans, in a blender on medium speed until combined. Stir in the pecans and pour the mixture over your pre-baked crust. Return to the oven, and bake for an additional twenty minutes. Remove from oven and sprinkle with enough powdered sugar to barely coat the surface. Allow bars to cool before cutting. If I had to pick one recipe that represents my signature dish, I wouldn't hesitate to say cheesecake. I made my first cheesecake for my mom's card club pals back in the mid 80's. The recipe was from the most popular diner in Massillon, Ohio-The Sugar Bowl. The cheesecake was too sweet, had too thick of a crust, and was concave. The bridge players loved it. To that point, it was the only cheesecake I had ever eaten. As I went off to college, and then moved out of state, I cultivated a cheesecake awareness which led to a mild obsession. I purchased several cookbooks devoted exclusively to cheesecake and I studied them diligently. When I worked for GE in Atlanta, I ran a little side business making baked goods for my coworkers. The most requested dessert was cheesecake. I began to experiment with different flavors-pumpkin, key lime, Black Forest, and whatever else my imagination or my client's taste could come up with. All that practice allowed me to hone my technique, which is critical in creating the perfect cheesecake. Normally I don't look at a recipe as a binding set of rules that must be adhered to, but with this confection, you must. Follow my instructions, use the ingredients I suggest and you'll be fine, just fine. Rule number one You cannot rush a cheesecake. It must be made the day before serving, and allowed to chill at least overnight. Rule number two You must allow your ingredients to come to room temperature prior to mixing. Yes, even the eggs. Trust me when I tell you that I've never had anyone fall victim to salmonella poisoning after consuming my cheesecake. Rule number three Make sure your oven has been preheated for at least a half hour prior to putting the cake in. Rule number four You must use a spring form pan. There is no acceptable alternative. Rule number five There are no substitutions for the ingredients either, with the possible exception of the sour cream which may be unavailable regionally. Still, use Daisy if you can get it. 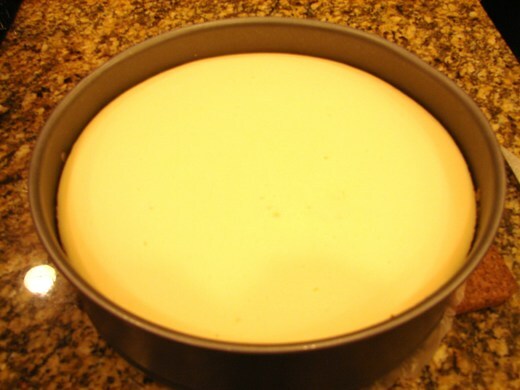 This recipe is for a deep 8 inch, New York style cheesecake. You can also make it in a nine or ten inch spring form pan, it just won't be as thick. For a basic cheesecake, I use a graham cracker crust. For some of my flavored varieties, I use ginger snaps, Oreos, Nilla Wafers or a homemade cookie dough crust. I love a good graham cracker crust with this though and it's pretty traditional. My crust just covers the bottom of the pan. I don't work it up the sides, although you can do that-just increase the ingredients by 50%. This is not a super sweet cheesecake. I prefer desserts that don't require an insulin injection after consumption. If you want it sweeter, add another 1/4 cup sugar. Combine the ingredients well. Prepare your spring form pan by covering the removable bottom with waxed paper, then securing it with no wrinkles by locking the sides. This enables a clean removal from the pan and makes serving much, much easier. Keeping the mixer on the lowest speed, add the eggs one at a time, waiting to add the next one until each in completely incorporated into the batter. Finally, add the sour cream and mix until perfectly smooth. Pour the batter into the crust. Bake at 350 degrees for ten minutes, then turn oven temperature down to 225 degrees. Check the cheesecake after 40 minutes, if the center is jiggly-it's not done. The top should be smooth and dry, and won't move if pan is gently shaken. Do not overbake, or you'll have a cracked surface. 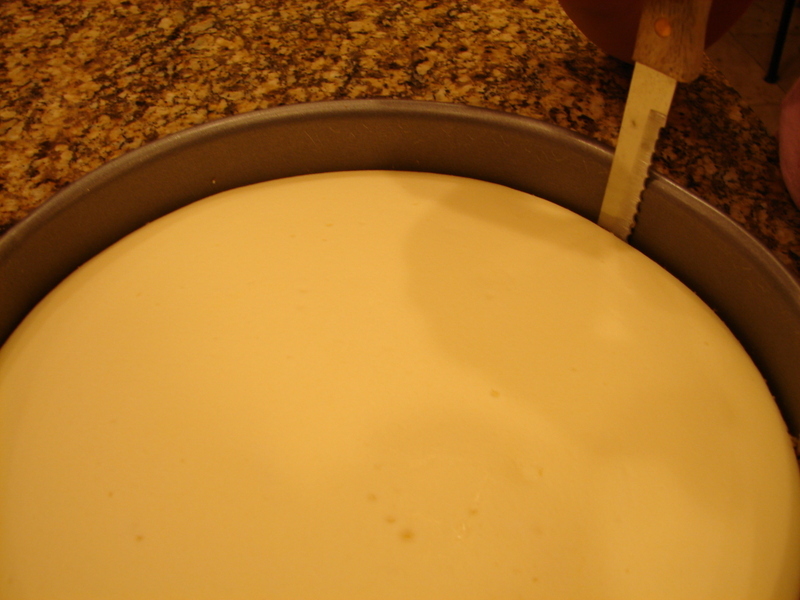 Once the cheesecake is done, remove from the oven immediately and take a thin, sharp knife and run along the edge of the cheesecake, using the pan edge as your guide. This will prevent the cake from sticking to the pan as it cools. It must be done as soon as it is finished baking. Go slowly around the perimeter so as not to break the edge of the cake. Allow the cake to cool slightly before refrigerating, rushing it into the cold environment will cause condensation. Again, allow it to cool overnight. Top with fresh strawberries or red raspberries. Oh yeah! The easiest way to cut your cheesecake is by using unflavored, waxed dental floss. Works like a dream! While I was cleaning the kitchen, four ever rapidly rotting bananas mocked me from their hook on the counter. I hate bananas. I wish I liked them, they're so convenient, so good for you-and yet their cloying sweetness gags me. My kids like banana bread, sans the nuts, so I decided to pore over my recipe books and the Internet and find a recipe worthy of the decaying fruit. Even though I didn't plan on eating the final product, I took the recipe search seriously. I couldn't find anything that looked better than bland, so I improvised. The result was two perfectly formed loaves, they smelled great, the texture was perfect and most important- the kids seemed happy with the results. Blend this by hand, don't use an electric mixer. Pour into two greased loaf pans, and bake at 350 for 50-60 minutes. Loaves form a nice brown outer crust, but remain moist inside.